COMMENTARY ON "THE WORK OF THE HOLY SPIRIT"
Today’s lesson presents two Bible verses that are among my favorites. They are reposted below, and I have emphasized the portions that I want to focus on. I really love these verses. At it’s simplest Jesus is promising that the Holy Spirit will come and reveal truth. Where false teachers will deceive you though is that they will not point out that these passages don’t say how this happens. After failing to do so they will ask you to eisegete the answer to that with the unbiblical concepts that they supply to you. I don’t know if this weeks lesson is going to do that or not. If they do I will point it out, but enough people do this that it’s good for the reader to be aware and be prepared when they hear it. To help the reader with that I am going to present how with other scripture, one of which comes later in the same passage. Who is Jesus saying that the Spirit of truth will guide into “all truth”? The word he uses is “you”. Who is he saying that too? Read the context, it’s the apostles! Our narcissistic culture likes to read ourselves into that narrative. But we were not there, Jesus is saying this directly to the apostles. This is even more clear when you go on reading and see it actually happen to the Apostles in Acts. May I also point out that none of us were there? How do we receive this truth today then? Well fortunately the Apostles wrote it down for us, we have the New Testament. So if you want what to know the details of what they received you have to go and read it or hear someone preach it. By this gift that God the Holy Spirit has promised to give his Church faith. I am going to pick through the train wreck of today’s lesson very carefully. I think they have set some kind of record on false-teaching-per-word count. Can I call that FTPW for short? Fortunately most are along the same lines of thinking so I will just separate them categorically rather than chronologically. Really? Okay… why do I need grace then? And why does the same verse you quoted yesterday say that he reproves us of sin? Hmmm… What are you helping them from? Without preaching the law first to condemn them of sin the gospel has no meaning. What are you going to say? That Jesus died and rose for you so that you can hear a nice story about how he rose? What’s the reason what does it mean? How does it apply to you if not for sin and your need of a savior? When you say “who are we” you mean to answer that with the “priesthood of all believers” (1 Peter 2:5) right? Is this question a joke? Are they really saying we should not preach the Word, and in doing so condemn the hearer of their sin? Doing so does not imply that the one preaching is sinless. If this isn’t done what meaning does Jesus dying for you even have? Without the law the gospel is just an anecdotal historic anomaly. So we do or do not bear true witness to his prosecutions? I’m sorry they are just making this too easy for me. Uh…. From what? Yeah I hate to keep hammering this point but it’s an important one. This statement above is meaningless without that. Ah here we go this is what they were trying to say. A fair question to ask is “how?”. The implication seems to be that a mystical personal revelation of one’s need for a savior will just happen entirely separate from God’s Word or the Church. Maybe when they are singing praise songs and the smoke machine turns on they will get an ooyey gooyey feeling in their heart which is of course God the Holy Spirit and he will convict them then while they worship a “burning in the bosom” as if it were God. My apologies in hammering that point so vividly but this has to get said as it’s a real problem. At best this is an introspective worship of one’s self. At worst it is demonic. There is no promise in scripture that this subjective exchange will transpire and we certainly should not be regarding the transitory emotions in our heart as the presence of God. What after all does the scripture say about the heart of man? The scripture teaches God coming to you and saving you from the outside of your body coming in, not from the inside going deeper. We should be looking to where God has promised to be, not where he has not promised to be. He has promised to come to use through his Word, and by this give us saving faith. He has even supplied preachers to go out and about for those who can’t read or don’t have a copy. With the two passages above compared to each other we see this concept of saving faith coming through the preaching of the Word. This changes us from the state we see below…. Into a new state where our very hearts are changed by God into something new. Read the passage below very carefully, follow the verbs and nouns. Ask yourself who is performing this verb? And which noun is receiving that which is performed? And I should mention, this is necessary for all of us, we have all sinned and we all need God to give us faith. This isn’t chicken soup for the soul or an ooyey gooyey subjective emotion. This is God the Holy Spirit saving you through the Word of God, delivered to you in your life. Everyone needs this because we are all sinners. Today’s lesson is many folds better than any other I have ever read from an SDA quarterly. I could nitpick at specific word choices here and there but out of respect I just won’t. I wish they wrote like this more often, or at least once a week. There is a very brief allusion to the investigative judgement with the question halfway through, but even that is vague enough that it could be interpreted in a variety of ways. In the majority of the lesson though the author gives an excellent presentation of the Gospel as the solution to the law. We are saved by the imputed righteousness of Christ, who died on the cross to save us from our sins. You can’t earn this. Today’s lesson attempts to discern the judgement that John 16:8 is speaking of. Specifically he asserts that Satan is being judged in this verse, not anyone else. I don’t think that works though, the statement is very broad, and notice that the object receiving it is the “world”. One would have to assert that the “world” only means Satan. I don’t think I would be alone is calling that a stretch. I would say a more natural understanding of this is that just as Paul condemns the reader with the law and offers the gospel as the solution, so we do the same in preaching the Word of God. This condemns the hearer, reproving them of sin, and righteousness, and judgment. 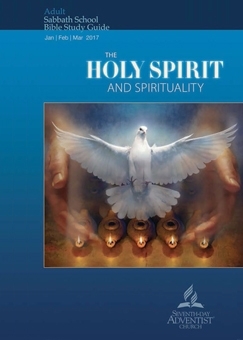 Through this God the Holy Spirit works actively in with and under his Word as it is preached. And this certainly is and has been proclaimed the world over (in a broad sence) several times over many generations in fact. I think that’s a more natural way of understanding the text, I’ll let the reader decide. In my opinion the author of today’s quarterly lesson is trying to bend this verse to another piece of theology he holds to rather than let it and many others change his theology. I can’t help myself, I am going to have to answer the question that they pose at the beginning directly. The author basically answers his own question in the question itself. The basis he presents is man in that he turns us to ourselves. Notice “we” are the ones who must “accept” in order to “have” assurance. Remember that passage I quoted in Colossians back on Monday? Who was the one without hands? Who was the one baptizing you? Who was the one quickening you? What part did the reader play in that? It is fair to categorize “decisions for Jesus” as a good work one will likely do after receiving faith and being a believer. But if you put that decision as contingent upon receiving faith you end up denying original sin and obfuscating the Gospel at best. It would be better to see mans will as the object of conversion rather than a participant in it. The rest of the lesson doubles down on this error and turns the reader to look to their actions. One is to view their progressive sanctification experience as objective evidence of salvation. This is the assurance that the author gives to the reader. The problem is that this is a very poor thing to look to for assurance and will only lead to despair. For starters, as one grows in sanctification they are only going to become MORE aware of their sin not less. This is going to be a source of despair not hope, which is why we need to hear the gospel as often as possible. The law as it is preached continuously kills the “old man” day by day while the “gospel” raises the new in his place. This happens over and over throughout the normal Christian life. This is the push and pull between the new and old man that Paul speaks of in Romans 7. Keep in mind, I am not saying the author is technically incorrect. We should expect that the believer will change. This is normal and it is very true. But we should not turn to our works, experiences, or decisions as a measure of assurance. This is subjective at best and only leads to despair. Even Paul struggled with this as you see in the passage above. Will others notice that you have changed? Sure. Should this encourage you? Of course. It’s just not the best place to look to for assurance that’s all. One should look to Christ for their assurance, know that you have heard his Word and have been given faith. Look to the time in which you will hear it again and know that you are forgiven in Christ. It is in him that your salvation is found, look to him objectively and know that he has promised you have received faith by his Word. Instead of looking inward at yourself for assurance look to Christ. If you’re confused it’s because I quoted from the King James. The verse above is frequently quoted from modern versions which use the word “love” instead of “charity”. The meaning is essentially the same. If you check in a 1611 dictionary you will see that the word “charity” means love but also conveys an action (verb) component to it. Today the word “love” can also be a passive disposition or emotion. I don’t know which is closer to the Greek as that isn’t something I am trained in. But the difference is interesting and worthy reflection in my opinion. The next verse that they give is Romans 5:4,5. I am going to reference a wider section of the context though to make my point. What I want to point out is that hope and love are placed chronologically after faith and are attributed to those already standing in faith and justified. As I covered yesterday we should expect to do good works after we are converted and made new. Good works that include “hope” and “love”. But these should not be looked at for assurance or even in a gospel sense. Hope and Love are law not gospel. The only one who truly is such things is God, and he has expressed these virtues to us by dying for us on the cross. It’s not a bad lesson really, it leaves a lot to be desired on how they define love. And at least to me it appears they are presenting the law as the gospel rather than distinguishing between the two. As far as SDA lessons go though I have seen much worse. Today they have given us a quote from Ellen White where she summarizes her pneumatology. To me it sounds like she is talking about the Force from Star Wars more than she is God the Holy Spirit from the Bible. To be fair this is a very common error not specific to Ellen White. The problem is that she doesn’t present how God the Holy Spirit does what he does. We are meant to assume that he works from within going deeper rather than in with an under external means by which he creates faith inside of us. The latter is Biblical and objective, assurance can be found there. The former is subjective and leads us to look to ourselves. She presents the Word of God as something that is still being written rather than a closed canon. Does she mean to include her own writings in the “Word of God”? She doesn’t seem to say she just hangs it there for you to make assumptions, none of which can be healthy or Biblical. Copyright 2017 BibleStudiesForAdventists.com. All rights reserved. Revised March 17, 2017. This website is published by Life Assurance Ministries, Camp Verde, Arizona, USA, the publisher of Proclamation! Magazine. Contact email: BibleStudiesForAdventists@gmail.com.